No deck or courtyard looks complete without outdoor blinds! 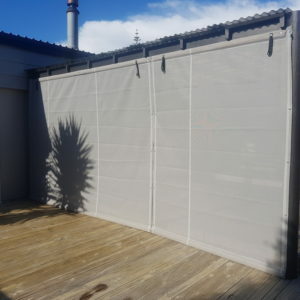 We provide an wide selection of outdoor blinds to shelter any outdoor space from the natural elements. So, no cooler breezes, harsh sunlight and driving rains inside! Buy top-quality outdoor blinds created using robust products and control climate all year round. Covaflex offers Crankit, ProZip, Fixed and Roller-style patio blinds at reasonable rates. Choose the color and style to compliment your home's curb appeal. Explore our endearing range of out door blinds and cherry-pick your favorites!